Excuse my photos on this review please. It was hard to take pictures with all the different color lights flashing overhead. This year I decided to coach my sons Basketball team. At the end of the season the team gave me club level seats to see the Florida Panthers vs. Boston Bruins at the Bank Atlantic Center in Sunrise, Florida. When we got up to the club level we were in awe with the food choices. This isn't your everyday sports venue eating establishment. This is like a fancy restaurant with different food stations. Shockingly, I chose the pizza. The pizza was an individual one made from scratch in front of you. Although they had about 4 different types, I chose the plain. At a cost of $10.00 for this small pie, I was reluctant....but you know how it is. You see pizza, you have to try it. The pizza itself was very undercooked. The crust was not crisp and almost tasted like white bread. They put 3 cheeses on this pizza I found out after tasting. It was Mozz, parm, and cheddar. YES I SAID CHEDDAR (GROSS), The sauce wasn't terrible though, and considering how hungry I was I managed to finish it. Well I finished everything but the crust, cause I figured I could always have some wonder white bread later that evening if I had the craving. 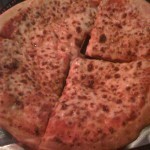 I will give the pizza place at the Bank Atlantic Center 3 out of 8 slices. It was better then domino's, but not as good as Subway Pizza.